Whether it’s natural disasters (earthquakes, floods, lava flows, etc.) or man made disasters (war, climate disaster, toxic pollution, etc.) it seems the poor always suffer the most. The rich have more options. The poor have few, if any, options. In most natural disasters, those with money can easily relocate, and often have a second or third home to go. Some poor people don’t even have enough gas money to get to a disaster shelter. Who bore the burden in hurricane Katrina in Louisiana, and hurricane Harvey in Houston? Poor communities also usually bear the burden of toxic pollution. Flint Michigan’s lead water is a case in point. 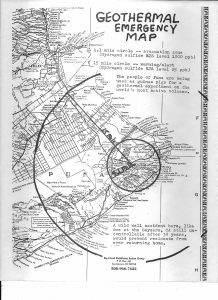 The Hawaiian Homestead area in Keaukaha in Hilo has as a next door toxic neighbor -–the airport, dump, fuel tanks, sewage plant, harbor, chemicals, etc. In wars such as Vietnam, the rich like Donald Trump and George Bush, easily found ways to avoid the draft and they certainly didn’t go to jail for nonviolent resistance to the war. The poor end up drafted or enlisting and dying in a rich man’s war for resources. In today’s wars, those being killed, injured and made refugees are disproportionately poor. Look at Palestine, Syria, etc. Puna, Hawaii, the site of the current lava flow, is the poorest district in the state, with thousands of lots in substandard subdivisions, many in high risk lava zones or near the toxic neighbor –Puna Geothermal Venture. Read the book “Land & Power in Hawaii” by George Cooper and Gaven Daws. Also read the article by Alan D. McNarie http://www.civilbeat.org/2018/05/big-island-how-land-schemes-turned-lava-fields-into-subdivisions/ By contrast the Kona-Kohala coast on the west side of Hawaii island is known as the Gold Coast with it’s many rich gated communities and high end resorts. The resorts never built housing for their employees, so many employees have to commute from distant Puna and Ka’u poor districts. Economic apartheid! I haven’t heard of one hotel offering free or discounted rooms to people displaced from the lava. And what of long range plans for people who have been displaced and have lost their homes, farms, businesses, etc.? Is it not the role of government to help? But where will the money come from you ask? That’s easy. From the FY 2019 Donald Trump proposed U.S. military budget of $681.1 billion. After all, what are we defending? And once we have recovered from disaster, we can begin the work of building a new economy from the ground up. That starts with growing food to feed Hawaii’s population instead of importing 90% of food consumed here. That will demand policy changes away from addiction to war and catering to the rich. The endless growth of tourism and militarism is killing Hawaii and the planet. Pele is telling us we need a fresh start and that we need to work together. Press Release — Possible Puna Geothermal Venture wild wells from Earth quakes or lava. Lava within 100 yards of the Puna Geothermal Plant (PGV) which has more than 6 geothermal wells. It should be noted that Hydrogen Sulfide H2S which comes out of geothermal wells is different than the gas that comes out of the lava –Sulfur dioxide (SO2). Hydrogen sulfide at low levels has a rotten egg sulfur smell but at high levels is deadly and is odorless and colorless. It is a heavy gas so collects in low areas. I personally gave a copy of this map to Hawaii County Civil defense director Talmage Magno on Friday, May 18 at the Hilo Civil defense office. This HB 1565 is a travesty! It subverts any semblance of protecting people’s democratic input and undermines current land use regulations. It removes contested case process and fast tracks development for corporate interests. Such things as TMT, GMO, Geothermal, and runaway development in conservation and coastal areas. Kill this bill now!. Shame on the people who introduced such a bill. It’s a disgrace that citizens even have to submit testimony to uphold such basic hard fought basic rights regarding land use. Jim Albertini, President, Malu ‘Aina center for Nonviolent Education & Action. 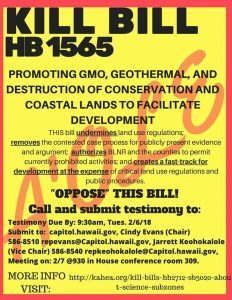 Aloha Mauna ʻOhana, we must kill this bill 1565. Hereʻs a sample testimony for you to reference. Call Cindy Evans, Jarrett Keohokalole today!!!! This proposed bill is a blatant special interest bill for the benefit of private entities and corporations with a clear disregard of Hawaii State Constitution Article I, Section 5 as well as other constitutional provisions and statutory laws. It is very evident that this bill is in response to the Thirty Meter Telescope International Observatory LLC’s attempt to circumvent the judicial and approval process for a project that intends to take control and use of public lands in an environmentally and culturally sensitive area within a conservation district on Mauna Kea. 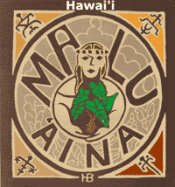 This bill would strip the State’s constitutional obligation to protect the public trust, natural resources, environmental rights as well as native Hawaiian customarily and tradition rights in which the State is compelled to protect as stipulated in the Hawaii State Constitution Article XI, Sections 1 & 9 and Article XII, Sections 4 & 7.